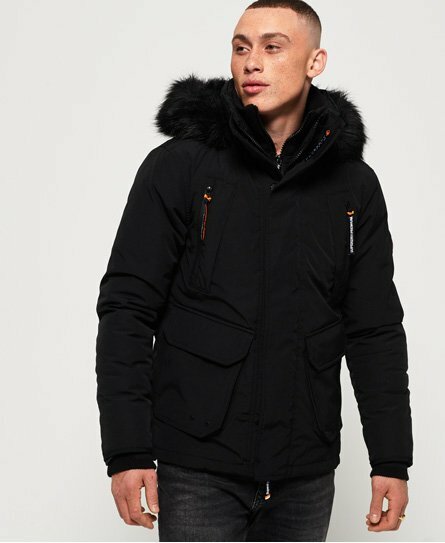 Superdry men's Premium Ultimate Down jacket. Stay warm in style this season with the Premium Ultimate Down jacket, with a 90/10 premium duck down filling and a very high fill power rating this jacket will make sure you're ready to take on those colder days. It features a detachable hood with a faux fur trim, a double layer zip fastening plus hook and loop fastening for extra protection against the cold. The jacket also features eight front pockets and one zip fastened inside pocket, perfect for keeping your valuables safe. The jacket is completed with a double layer collar and a Superdry logo badge on one sleeve.